Join the Business and Economics Polling Initiative Today! 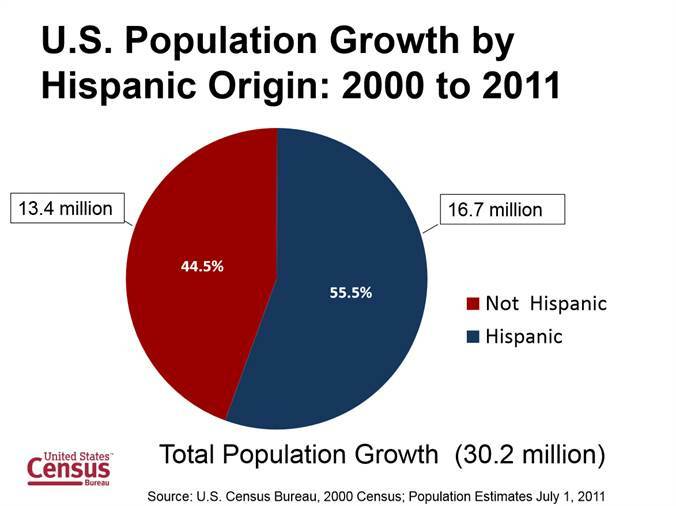 Hispanics are the nation’s largest and fastest growing minority group. One American in six is now Hispanic. By 2060, Hispanics will account for nearly one in three people in the U.S. Today, about 60% of U.S. adult Hispanics speak English or are bilingual. 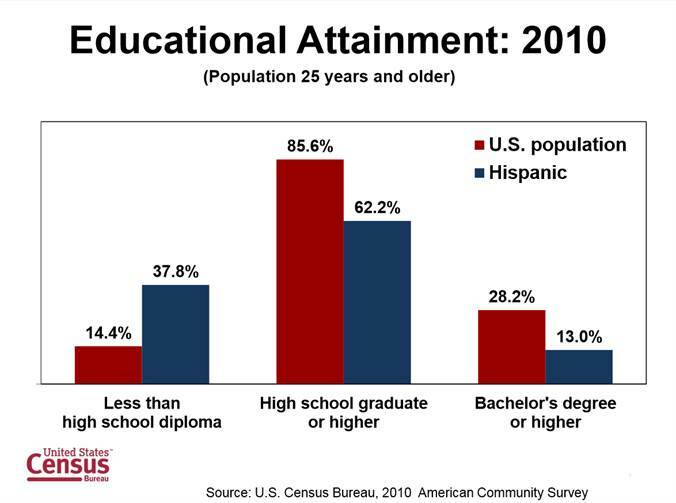 66% of Hispanics 25 and older had at least a high school education in 2015. 14.8% of Hispanics 25 and older with a bachelor’s degree or higher in 2015. 4.68 million Hispanics 25 and older had at least a bachelor’s degree in 2015. 1.456 million Hispanics 25 and older with advanced degrees in 2015 (e.g., masters, professional, doctorate). 16.5% of students (both graduate and undergraduate) enrolled in college in 2013 were Hispanic. 23.5% of elementary and high school students were Hispanic in 2013. 15 million Hispanic family households in the U.S in 2015. 47.8% of Hispanic family households were married-couple households in 2015. For the total population in the U.S., it was 73.1%. 56.7% of Hispanic married-couple households had children younger than 18 present in 2014, whereas for the nation it was 40.1%. 64.9% of Hispanic children were living with two parents in 2014, whereas nationwide it was 68.7%. 46.0% of Hispanic married couples with children under 18 where both spouses were employed in 2014, whereas nationwide it was 59.7%. 34.5% of the Hispanic population was foreign-born in 2015. 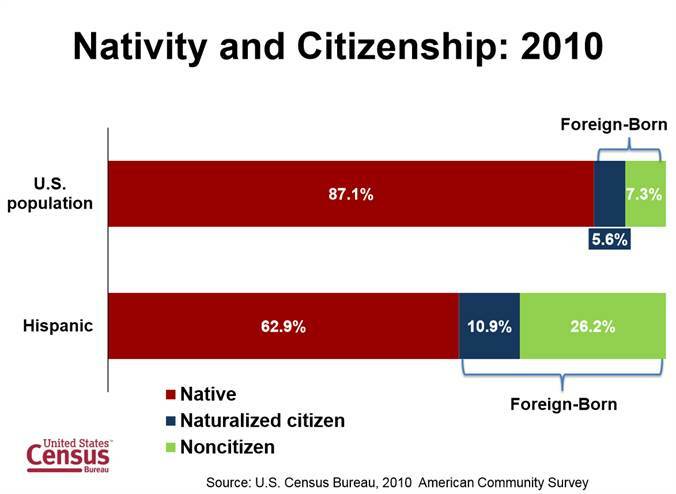 64.3% of the 10.3 million noncitizens under the age of 35 were born in Latin America and the Caribbean and were living in the United States in 2010-2012. Hispanic households experienced an annual increase in median income between 2014 and 2015, from $42,491 to $44,782. 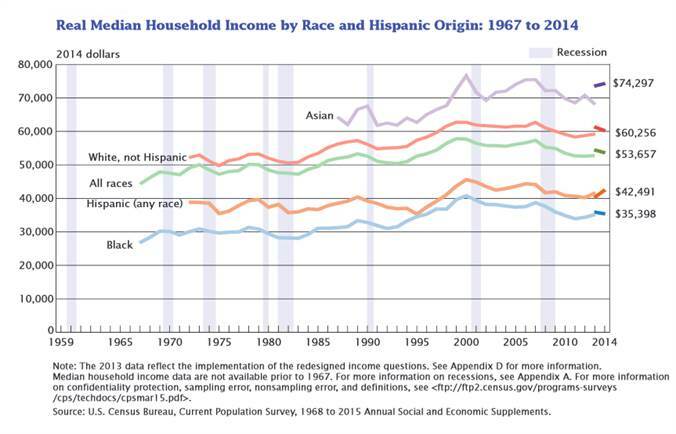 Among the race groups, Asian households had the highest median income in 2015 ($77,368). The median income of non-Hispanic White households was $60,256, and for Black households it was $35,398. $44,782 Median income of Hispanic households in 2015. 22.6% Poverty rate among Hispanics in 2015. 19.5% of Hispanics lacked health insurance in 2015. 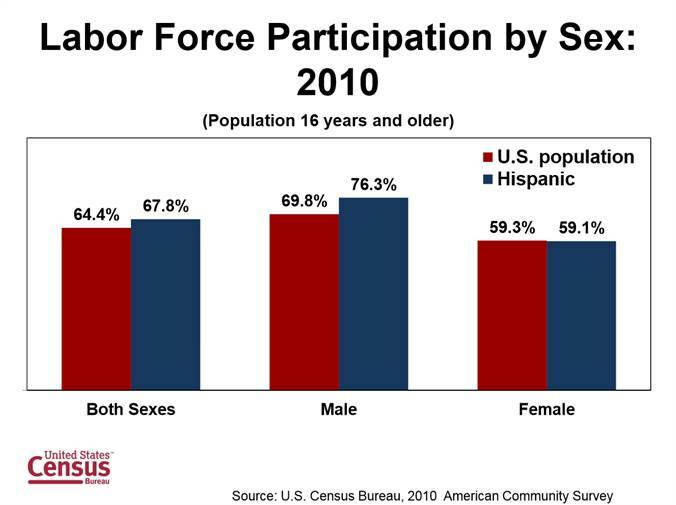 66.6% of Hispanics or Latinos 16 and older were in the civilian labor force in 2015. 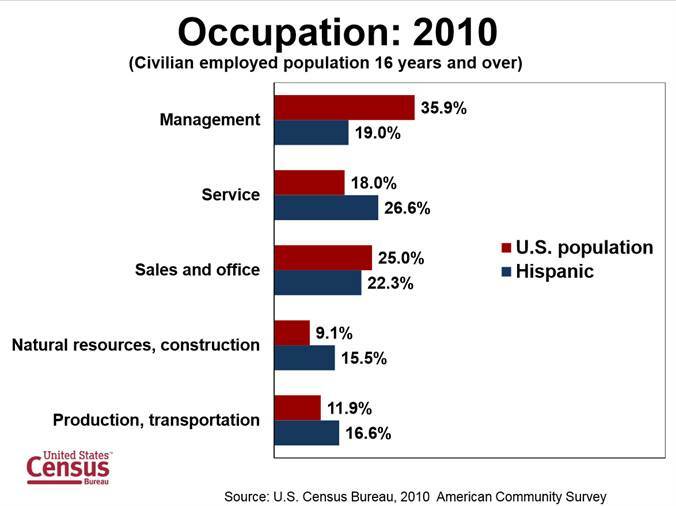 20.5% of civilian employed Hispanics or Latinos 16 and older worked in management, business, and science and arts occupations in 2015. 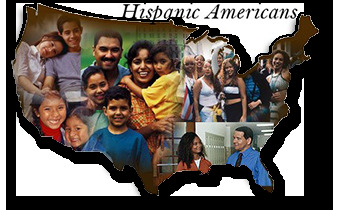 According to U.S. Census Bureau population estimates as of July 1, 2016, there are roughly 57.4 million Hispanics living in the United States, representing approximately 17.7% of the U.S. total population, making people of Hispanic origin the nation's largest ethnic or racial minority. 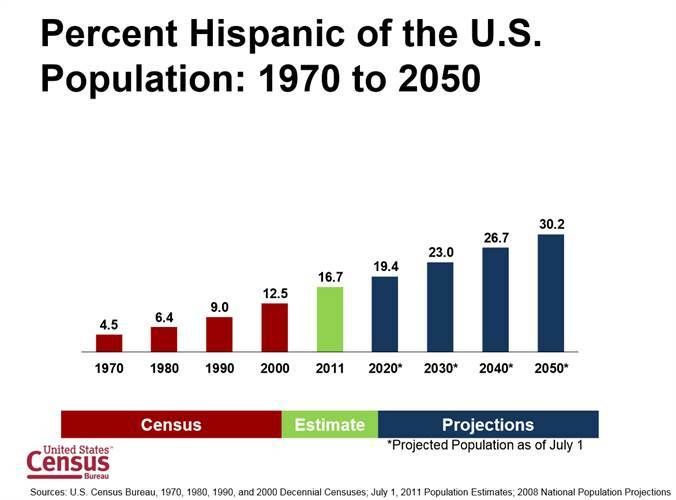 The U.S. Hispanic population for 2060 is projected to reach 119 million, constituting approximately 28.6% of the U.S. population by that date. 57.4 million Estimated Hispanic population of the United States as of July 1, 2016. 17.7% of the total U.S. population is Latino, making people of Hispanic origin the nation’s largest ethnic or racial minority. 877,494 thousand Hispanics were added to the nation’s population between July 1, 2015 and July 1, 2016. 63.3% of those of Hispanic origin in the United States were of Mexican background in 2015. Another 9.5% were of Puerto Rican background, 5.8% Cuban, 3.8% Salvadoran, 3.3% Dominican, 2.4% Guatemalan and 1.9% Colombian. The remainder was of some other Central American, South American or other Hispanic or Latino origin. 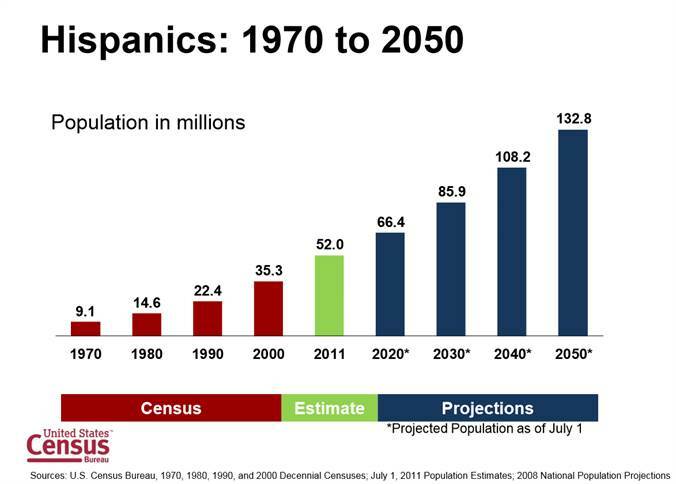 119 million Projected Hispanic population of the United States in 2060. 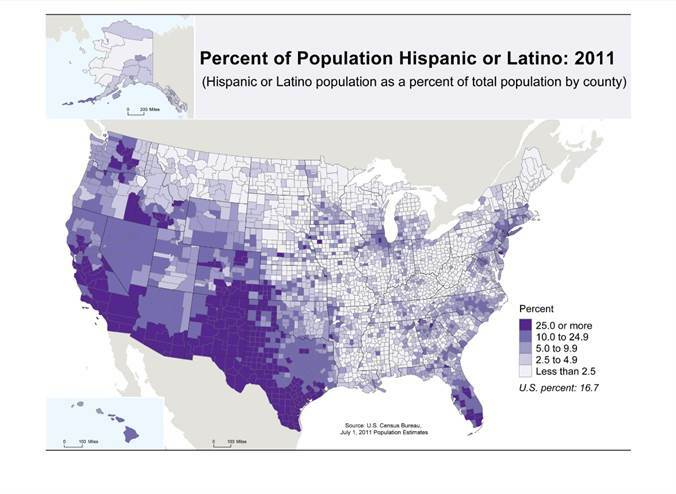 According to this projection, Hispanics will constitute 28.6% of the nation’s population by 2060. 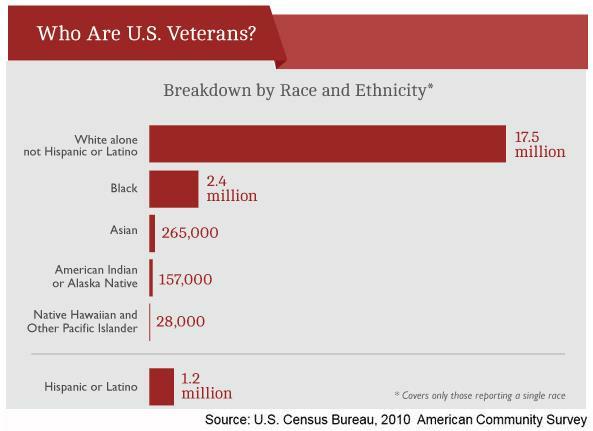 1.2 million Hispanics or Latinos 18 and older are veterans of the U.S. armed forces. 73.3 % of Hispanics 5 and older spoke Spanish at home in 2013. 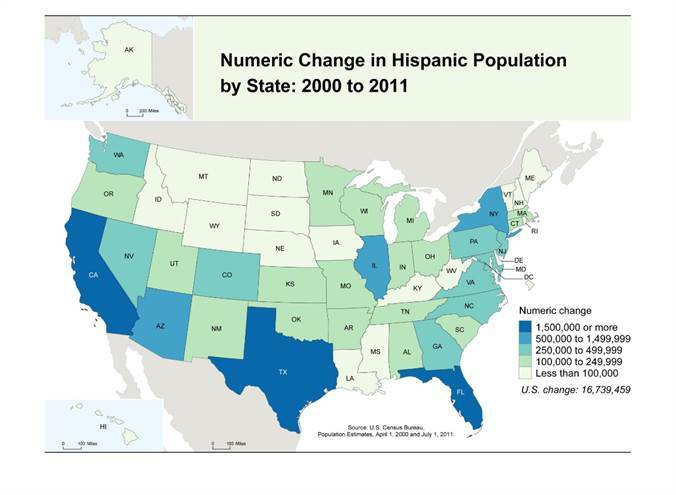 The nation’s Hispanic population continues to disperse across the U.S. The 100 largest counties by Hispanic population contain 71% of all Hispanics. Los Angeles County alone contains 4.9 million Hispanics, or 11.2% of the nation’s Hispanic population. 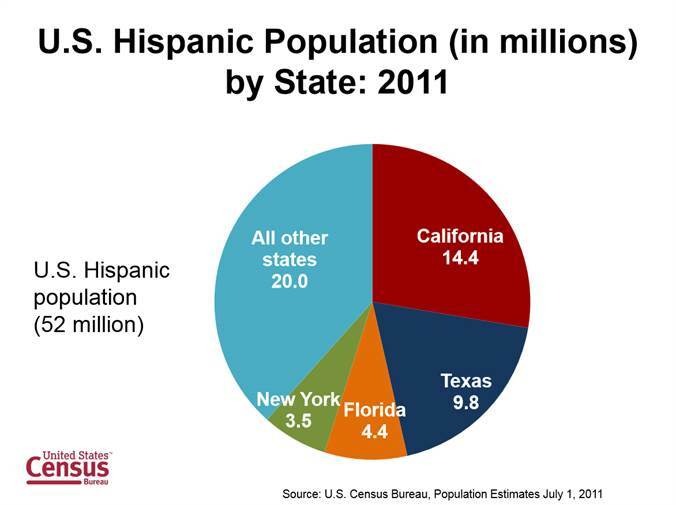 More than half of the nation’s total Hispanic population, 55% (30.2 million) live in California, Florida, and Texas. 9 U.S. states with a population of 1 million or more Hispanic residents in 2016: Arizona, California, Colorado, Florida, Illinois, New Jersey, New Mexico, New York, and Texas. 10.8 million Estimated Hispanic population in Texas as of July 1, 2016. 15.2 million Estimated Hispanic population in California. California has the largest Hispanic population of any state. 54% of the total Hispanic population of the U.S. lives in California, Florida, and Texas as of July 1, 2016. 4.9 million Hispanic population of Los Angeles County. Los Angeles County had the largest Hispanic population of any county in 2014. 45,000 Harris County in Texas had the largest numeric increase of Hispanics from 2013 to 2014. 8.4% of voters in the 2012 presidential election were Hispanic. Hispanics comprised 4.7% of voters in 1996. 7.3% of voters in the 2014 congressional election were Hispanic.